In Finland, people experience negative mood changes (low levels of Serotonin) related to the few hours of sunlight in the winter time. 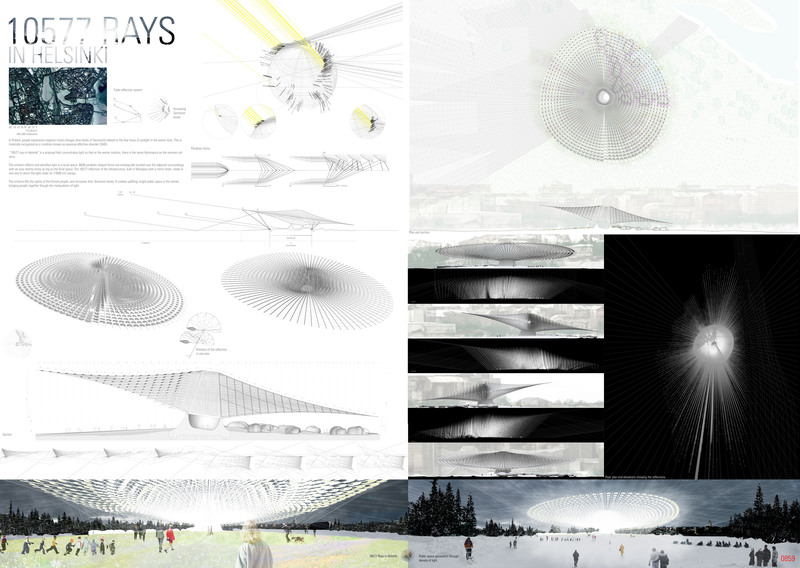 This is medically recognized as a condition known as seasonal affective disorder (SAD).“10577 rays in Helsinki” is a proposal that concentrates light so that at the winter solstice, there is the same illuminance as the summer solstice. The scheme reflects and densifies light to a focal space. 6838 parabolic shaped forms are strategically located over the adjacent surroundings with an area twenty times as big as the focal space. The 10577 reflectors of the infrastructure, built in fiberglass with a mirror finish, rotate in one axis to direct the light under its 11600 m2 canopy.The scheme lifts the spirits of the Finnish people, and increases their Serotonin levels. It creates uplifting, bright public space in the winter, bringing people together though the manipulation of light. Actualmente estás explorando las entradas etiquetadas con architecture en WASPMOD.